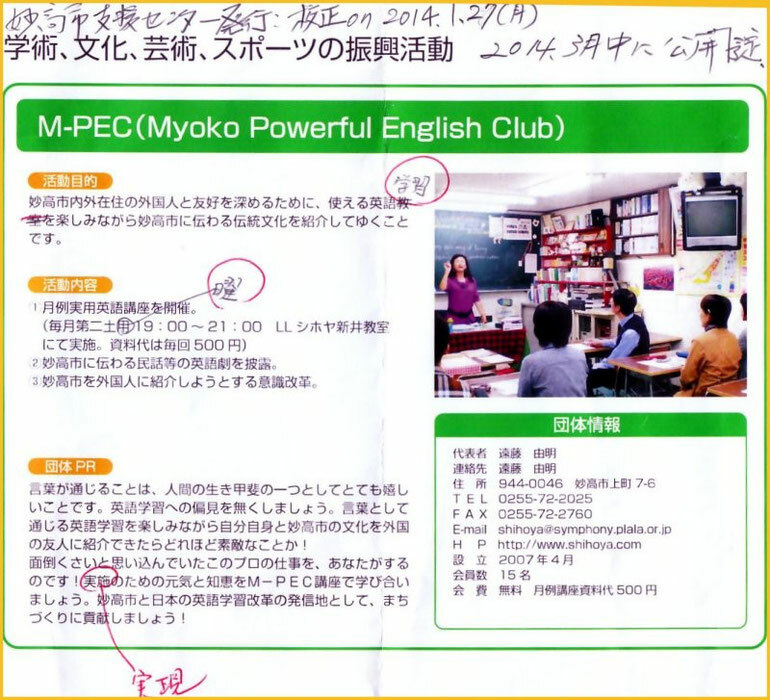 “Myoko City Support Center for Civic Activity” is going to publish the booklet, in which Yoshy’s way of thinking about learning English acquired through LL Shihoya Arai School and Myoko Powerful English Club (M-PEC) is printed by around mid-April, 2014. This column is Yoshy’s answer to “What is Learning English for us Japanese?” Since I am recruiting new LL students and new members of M-PEC now, let me introduce it in advance; though, excuse me, this picture is emendatory. Thanks to you, in this April, 2014, LL Shihoya Arai School is the 40th anniversary and Myoko Powerful English Club (M-PEC) is the 8th one. The common idea is “Hope You will be Vivid in Your Life through English Communication!” Everybody, welcome to LL Shihoya Arai School and M-PEC! Call 0255-72-2025.